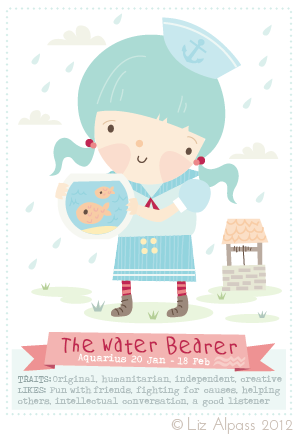 Yay, Aquarius! That's my sign :) I love this illustration. Happy Birthday Kelly and Siona! I hope you both have a lovely time celebrating! Im LOVING the new pastel look for your blog! Im sorry i havnt stopped by in a while. Gosh your work is just gorgeous! :) cute work! My husband is an Aquarius. A few Aquarians around isn't there. My partner is an Aquarian, so I think they are pretty rad too!! !